The following is my lecture at Founding Day Celebration Ceremony at SNI Hawaii Jisso Center, on March 1, 2009. Today is the Founding Day of Seicho-No-Ie. I would like to extend to all of you my sincere congratulations on this occasion of the founding of Seicho-No-Ie. Thank you very much. It has been 79 years since Seicho-No-Ie's Founding and more than that, we have one more auspicious thing today. As MC mentioned in his opening remarks, at Nagasaki Main Temple in Japan, Rev. Masanobu Taniguchi was inaugurated as President of Seicho-No-Ie on March 1st. Due to the time difference from Hawaii, the inauguration ceremony was conducted yesterday. Rev. Taniguchi ascended to Ryugu Sumiyoshi Hongu, the main shrine at SNI Main Temple where Sumiyoshi no Ookami, whose role is to pure the universe, is shrined, and succeeded the Seicho-No-Ie Presidency. Incidentally, Founder Taniguchi taught that the name of "Sumiyoshi no Ookami" is another name of "the Lighter of the Seven Golden Candlesticks." Furthermore, Mrs. Junko Taniguchi became President of SNI White Dove Association on the same day. Let us extend our heartfelt congratulations on their inauguration and vow to promote God's Humanity Enlightenment Movement - International Peace by Faith Movement with all SNI members throughout the world under the guidance from the New President. SNI Inc. prepared special sheets so that every Missionary Area member can write their sincere congratulations on the inauguration. I hope everyone who attends this ceremony will write some message with your name to them. SNI Inc. compiled all the Missionary Area's sheets and sent them to Rev. and Mrs. Taniguchi. 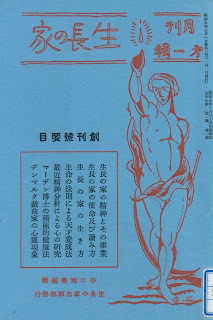 As you know well, Founder Masaharu Taniguchi started Seicho-No-Ie by publishing the first issue of "Seicho-No-Ie" magazine on March 1, 1930. Seicho-No-Ie is a Japanese name and is translated into English as "The Home of Infinite Life, Wisdom, and Abundance." However, this translation is not a literal translation. If you translate "Seicho-No-Ie" as it is, it should be "House of growth," because "Seicho" means "growth," "No" means "of," and "Ie" means "Home or House." But this translation does not represent the deep hidden meaning, therefore, we usually say, "The Home of Infinite Life, Wisdom, and Abundance." I think this translation is very good and enough to convey the deep meaning, however, I would like to show you furthermore the deeper meaning that Founder Taniguchi originally intended. To tell the Truth, our New President of Seicho-No-Ie, Rev. Masanobu Taniguchi expounded the true and deep meaning of Seicho-No-Ie at his first Public Lectures in the United States when he visited four U.S. cities in 1992. It was 17 years ago. Unfortunately, he didn't come to Hawaii at that time. But his lecture at that time was compiled and published as "WHAT IS SEICHO-NO-IE?" therefore, some of you might read that. Be that as it may, you may forget the content because the publication was made many years ago, so I want to learn the deep meaning of "Seicho-No-Ie" with you by reviewing the Rev. Masanobu's lecture. Please look on the left side of the screen. "sei" of "Seicho-No-Ie" is written in Kanji, or Chinese Character in this way. On the right side, the screen shows the ancient form of the pictograph from which the character derives. In this case, the Kanji "sei" derives from the image of a young cactus-shaped plant growing from the earth. A plant grows vertically. From its seed, a sprout grows upward, and the root extends downward. Growth also involves time. In this way, the word "sei" represents time. Please remember that. Let's move on "cho." The left side of the screen is Kanji and the right side is the ancient form of the character. This pictograph represents a person with long hair who has a hoe on his shoulder. His long hair is being blown in the wind. In this way, "cho" means length. Length is a measurement of space. We are living in the three-dimensional world which consists of height, width, and depth. All of them are measured by length. Therefore, "cho" represents space. From the above mentioned, I believe you understand that "sei" and "cho" are "time" and "space" respectively. Then, let's move on to "ie." "Ie" means house. House is a shelter where a family lives. On the right half of the screen, there is a pictograph of "ie," you can see an upside-down U- or V-shaped line half-encircling a funny figure with a curly tail. This figure represents a hog. In pre-modern China, a hog was raised inside the house. You may wonder why you raise a hog in a house, however, a hog was so highly valued for sustenance by a family that it was protected and carefully raised in a house. So, the word "ie" means a place in which something valuable is kept and raised. In addition to that, a house is a place where every member of a family interacts. It is also a place where different members gather to interact. Therefore, it is an intersection, namely, a place of meeting and interaction. 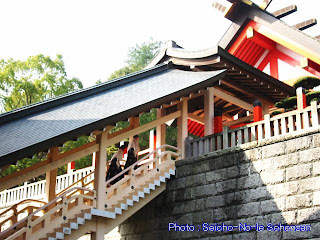 Putting all those things together, "Seicho-No-Ie" means the intersection or encapsulation of time and space. It means a point from which time and space emanate. You may wonder if there is actually such a point. Here, please think of seed. The seed is a point from which a plant's life grows through time and space. In other words, the seed is a point from which the plant's time and space extend themselves. However, you cannot see anything like flowers, or stems, or leaves in the seed. 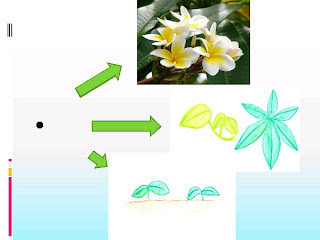 Nevertheless, we can say there is the source of those shapes or functions of the plant in the seed. It is invisible, but it surely exists, and we can say that everything is in the seed. Therefore, you can say that there is everything in "Seicho-No-Ie" and Founder Taniguchi taught that "Seicho-No-Ie" is another name for the great universe. Rev. Seicho Taniguchi taught that "All teachings are comprehended in Seicho-No-Ie" in his book, "Messages of Wisdom and Love." I believe you understand the deep meaning of Seicho-No-Ie that Founder Taniguchi intended and realize that the name manifests the Truth itself. That is why when we propagate and publicize our teachings, we should use and tell the name of "Seicho-No-Ie" as many times as possible with understanding the deep meaning. It means the more we say "Seicho-No-Ie," the more we disseminate the Truth. When I was a college student, Rev. Jun Okada just arrived in the Missionary Area I belonged to as Chief of that MA. At the first greetings he encouraged all the members gathered as follows: "Let us increase the number of people who think or who say 'Seicho-No-Ie' is wonderful. Let us fill all the prefecture with people who say 'Seicho-No-Ie is wonderful." Please pay attention. He never said to let us increase Holy Mission Fellowship Members. He didn't say that at all. Instead of that, he proposed to increase the number of people who love and appreciate Seicho-No-Ie. Every member liked the idea and started to say "Seicho-No-Ie is wonderful" whenever they met and they had a meeting and seminar with joy and happiness. By just practicing this, a sense of joy bubbled forth to those who said that and the joy prevailed to every nook and cranny in that MA. Then, what do you think happened as a result of it? To everyone's astonishment, in onlye year, another 10,000 people added to the 30,000 existing members at that time as Holy Mission Fellowship Members. Up to that time, they had increased less than 10,000 members in 10 years. Because of this, Rev. Okada did various things, but the main thing he did was to recruit who desire to make new members because to be a member means to have a ticket for eternal happiness. As you already know, a member can receive a wavelength of blessings from all over the world as long as you have a good antenna. To have a good antenna means to tune your mind to God. Rev. Okada told those who desire to make new members as follows: All you have to do is rejoice. If you have a mind that you want to make new members, it means that you are a Bodhisattva, or Goddess of Mercy. Dr. Taniguchi taught that God already prepared 10 people and more in your surroundings who want to be Holy Mission Fellowship Members. As you rejoice, the more people want to join us through you. Then, Rev. Okada asked the staff of the Missionary Office to make a name plate for Bodhisattvas who desire to make new members and hang those plates on the wall and be blessed. And he encouraged members to bless them by reading the Holy Sutras. What do you think had happened? One member, who could not have recruited a single member, said that "One of my friends whom I keep on giving a magazine asked me "When I read that magazine, I often found "Holy Mission Fellowship Member." What is it? Is it something I can join?" According to him, his friend became the HMF member with 4 family members." To our surprise, this kind of reports came to the Missionary Center one after another after that movement began, as I mentioned, and they had 10,000 new members in only one year without any special efforts other than rejoicing. How wonderful the power of joy is! Sometimes, I receive a kind of suggestion saying, "Why don't you think the reason why the number of our members declined?" I appreciate those suggestions every time, however, since we are taught to lead the "Sundial Way of Life" from our Founder Taniguchi and President Taniguchi, I want to put this way of life into our movement. By thinking that I am a child of God, there are many people who want to be a member in my surroundings, but because we have not yet opened our minds' eyes we could not find those people, Oh God, please guide me to find those people who want to join us, I believe we can move forward our movement without any special efforts. Since what we are promoting is God's movement, therefore, we should believe God guides and leads us as He wants. 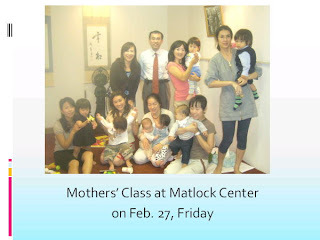 Since last August, we started a Japanese Mothers' Class at Matlock Center. We had the study class the day before yesterday with 8 attendees and 7 children, a total of 15 people attended the class. Among them, three women were completely newcomers to SNI. Other than my wife and I, none of the participants attended any SNI events before last August. Since my wife Terumi came here in July 2007, she sincerely prayed to God to give us women who want to attend our mothers' class in her morning Shinsokan Meditation every single day. She created her own prayer for the success of her mothers' class. However, nothing happened for a year. But then there appeared a woman who has a one-year-old boy whom Mrs. Kusaka propagated the teachings. She is Mrs. Miho. Mrs. Miho called my wife to attend our mothers' class and attended last August. Since then, she told many friends of her that SNI mothers' class is wonderful, SNI mothers' class is wonderful. Therefore, every time we have a class, we have a newcomer that Mrs. Miho invited to attend. I learned from this case that we have lots of invisible advocates and supporters even though they are not yet members, and sincere prayers are always answered. Since I came here, I've felt that we have wonderful leaders and members. And if we can successfully uncover the cap which prevents your infinite abilities from coming forth, I believe tremendous power will be coming into existence. I feel there are still some covers that cap your abilities. However, which direction we are going in is very important. We need to go in the same direction that the President shows and SNI Inc. and other all SNI members worldwide will follow. If we do so, and we move forward with God, we are able to look forward to a bright future for SNI Hawaii. This concludes my address. Thank you very much for your kind attention.